The abandonment of the Ten Tors challenge because of bad weather is only the second time in the event's 47 year history that the organisers have stepped in to halt the competition. The 2,500 young people camped on the moor, range in age from 14 to 20, and face weather conditions on the second day of the challenge described by one Army spokesman as "absolutely dire". The competitors will be escorted off the moor bringing to an end an event which most have trained for months to take part in. It has since grown with about 2,400 young people in 400 teams of six members each taking part. In the weeks before the event, teams go out on the moor to train for the routes which are 35, 45, or 55 miles long, depending on the age of the competitors. 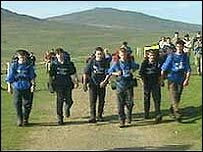 The Ten Tors was abandoned for the first time 11 years ago when Dartmoor was struck by a sleet and snow storm. Teams taking part in the May 1996 expedition had to contend with poor visibility and bitterly cold conditions on the high moor. A total of 2,100 of the 2,400 taking part were taken off the moor in the extreme weather conditions. The Army, which organises the event, co-ordinated the mass movement of the teams with helicopters playing a crucial role in bring the youngsters to safety. In 2001 the challenge was cancelled because of the foot-and-mouth outbreak. The only tragedy to hit the event occurred in March when 14-year-old Charlotte Shaw died as she took part in a training exercise. Charlotte, a student at Edgehill College, in Bideford, north Devon, fell into a rain-swollen stream. Army spokesman David Harris described the weather facing this year's competitors as "absolutely dire, really nasty." The ground is extremely sodden while it is very cold and fog and mist could cause some teams to become disorientated, he said. "Dartmoor is throwing the worst of its weather at the eventers this year. "With more extreme weather forecast we have a concern that safety could be compromised and we are not prepared to do that. "To avoid that we have decided to end the Ten Tors early with very much regret."